Health status at older ages has improved, not worsened; labor force participation has not kept pace. Raising the eligibility ages for benefits is sometimes advanced as a possible response to the rising cost of Social Security and Medicare that will be associated with the aging of the U.S. population in coming decades. By raising the age at which pension and health benefits could be claimed, these changes would make it more costly for older individuals to leave the labor force. 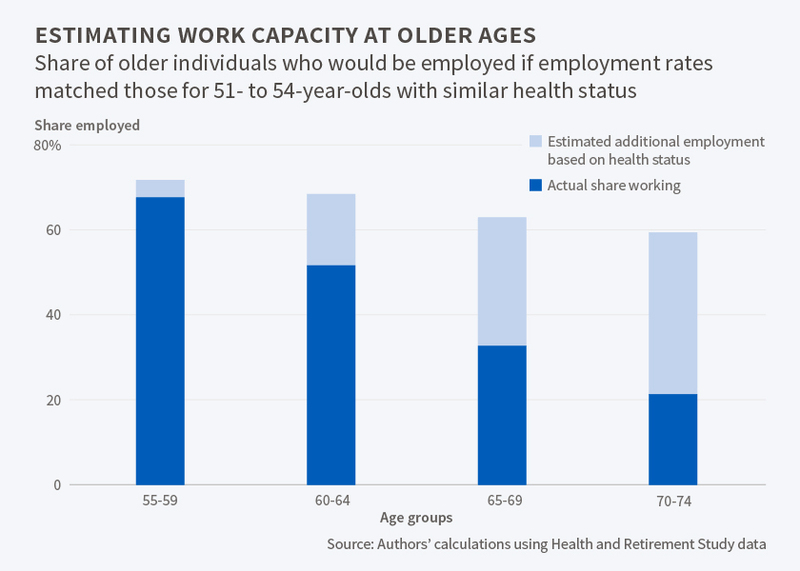 A central issue in evaluating such proposals is whether older Americans have the health capacity to work longer than they currently do. In Health Capacity to Work at Older Ages: Evidence from the U.S. (NBER Working Paper No. 21940), Courtney Coile, Kevin S. Milligan, and David A. Wise find that many of today's workers are healthy enough to extend their working lives. The study employs several yardsticks to measure health capacity in the retirement-age population. The researchers first compare the employment of older men today to that of men in the past with the same level of health, measured using mortality risk. In 1977, a 49-year-old man had a 0.8 percent chance of dying within a year and 89 percent of 49-year-old men were participating in the workforce. By 2010, the age at which the male mortality rate was 0.8 percent had risen to 55, but 55-year-olds' labor force participation rate was just 72 percent. If men in 2010 had exhibited the same labor force participation rates as their 1977 predecessors who faced the same mortality rates, i.e., if 55-year-old men in 2010 had participated as much as 49-year-old men in 1977 and so on for men of other ages, then on average men would have worked an additional 4.2 years between the ages of 55 and 69. The researchers note that their findings are somewhat sensitive to their choice of base year. If instead of comparing 2010 to 1977 they compared it with 1995, a low point in postwar labor force participation, they estimate that a 2010 worker would spend just 1.8 additional years in the workforce. The researchers also compare older individuals to slightly younger workers with similar health, measured using self-reported health conditions, disabilities, and medical care usage. They estimate that if older men had the same labor force participation rates as younger men who exhibited the same health status, then the labor force participation rate among 60 to 64 year olds would be 17 percentage points greater than it was, and that the analogous rate for those 65 to 69 would be 31 percentage points higher. They estimate that the average number of years worked between the ages of 55 and 69, which was 7.9 in 2010, would have been 2.6 years greater. The researchers found that improvements in self-assessed health were disproportionately greater among the highly educated, suggesting that they could be in a better position to extend their work lives than their contemporaries with less education. The researchers note that their study does not consider other factors that may affect workforce participation, such as age discrimination and business cycle fluctuations. They also note that while the older population in general is healthier than in the past, there are still some who may find it difficult to work and whose primary source of support is likely to be government transfer programs. They emphasize that their "estimates should not be taken as a reflection of how much older workers 'should' work." Increasing people's years at work "may not be a socially desirable outcome," they point out, "since leisure time has value as well." The ability to work longer can be hampered by skills that decline with age. Declining physical skills – such as diminished strength and flexibility – are easy to spot and often associated with blue-collar jobs. But white-collar jobs may also require abilities that decline with age, including cognitive and fine motor skills. The analysis created an index measuring the reliance on skills that decline with age for over 900 occupations. The results show that while blue-collar jobs are more vulnerable to eroding skills, some white-collar jobs are vulnerable too, which can lead to earlier retirements. The Social Security Advisory Board has appointed members of a Technical Panel to examine future trends in labor supply, a key factor in projections of revenues and expenditures of the Social Security programs. 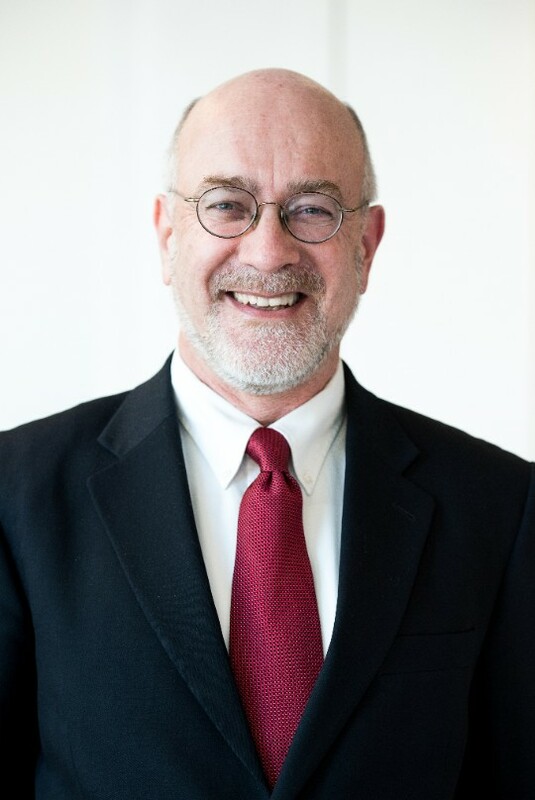 Robert A. Moffitt, Krieger-Eisenhower Professor of Economics at Johns Hopkins University and former editor of the American Economic Review, will chair the panel. Members will include: Gary Burtless, John C. and Nancy D. Whitehead Senior Fellow at the Brookings Institution; Chinhui Juhn, Henry Graham Professor of Economics at the University of Houston; Kevin M. Murphy, George J. Stigler Distinguished Service Professor of Economics in the Department of Economics and Graduate School of Business, University of Chicago, and Winner of a MacArthur Prize and the John Bates Clark Medal; and Kathleen McGarry, Professor of Economics at UCLA. Space is filling up quickly, so don’t forget to RSVP! If you can’t attend in person, be sure to watch the live webcast of the event. With the changing nature of work in America, the 20th century formula for providing protections and benefits to workers is falling behind 21st century innovation, and we must develop new ideas that can meet the long-term needs of workers and businesses alike. This event will explore how we might adapt the social contract for workers in America in a way that can make retirement benefits and protections more portable, with a focus on the policy challenges and opportunities to improve and adapt our current system. The event will feature keynote remarks from The Honorable Phyllis C. Borzi, Assistant Secretary of Labor of the Employee Benefits Security Administration, and a panel discussion that includes essential voices in the conversation around the intersection between new modes of work and retirement security. 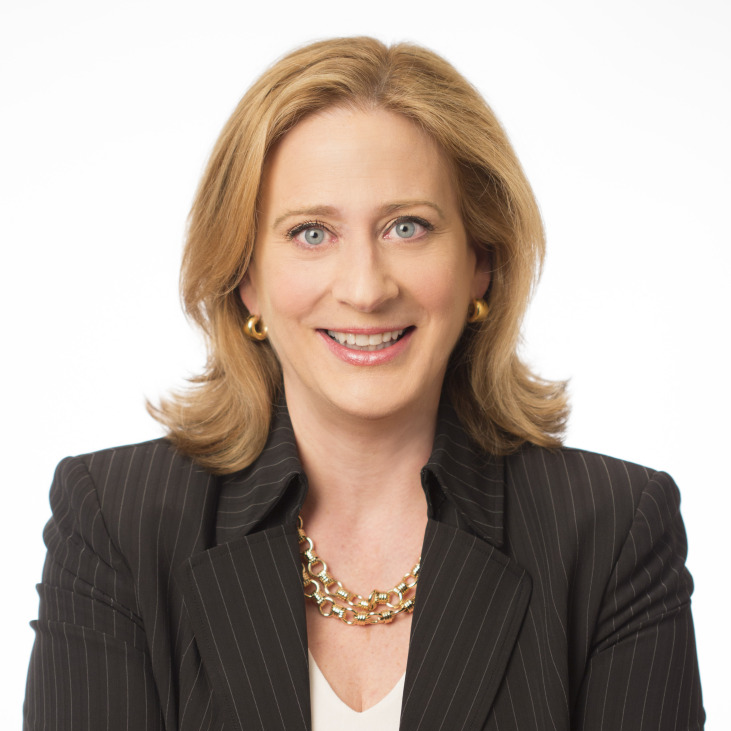 The event will be hosted by Ida Rademacher, Executive Director of the Financial Security Program, and Bruce Reed and John Bridgeland, co-chairs of the Future of Work Initiative. The Financial Security Program (FSP) is dedicated to solving the most critical financial challenges facing America’s households, and to shaping policies and financial products that enable all Americans to save, invest, and own. For more information on Aspen FSP, please visit www.aspenfsp.org. The Future of Work Initiative is a year-long nonpartisan effort to identify concrete ways to strengthen the social contract in the midst of sweeping changes in the 21st-century workplace and workforce. The Initiative will focus on two challenges in particular: first, how best to advance and protect the economic interests of Americans in the rapidly growing economy of shared goods and services; and second, how best to inspire a 21st-century capitalism for a 21st-century workforce by incenting employers to help workers get ahead. For more information, please visit as.pn/futureofwork. The Center for Retirement Initiatives (CRI) is delighted to launch a new policy blog. This will serve as an expert policy forum where the Center can share everything from the latest research and resources related to state retirement savings initiatives for private sector workers to federal legislative and regulatory developments. Read more. The Center on Budget and Policy Priorities has published an article by my former SSA colleague Kathleen Romig looking at the potential for promoting work by Social Security disability beneficiaries. We can do much more to support workers with disabilities long before they apply for DI, but it costs money. Expanding Medicaid in those states that haven’t yet done so would improve access to needed health care and ease the financial burden of disability. Improving access to the long-term services and supports that many people with disabilities need in order to work could help some of them rise above poverty. Boosting the Earned Income Tax Credit, particularly for childless workers, could benefit workers with disabilities. Other possibilities outside Social Security are adequately funding vocational rehabilitation, creating subsidized employment opportunities, and updating the asset limits in Supplemental Security Income, Medicaid, and other public programs. The Government Accountability Office has a new study, titled “Retirement Security: Shorter Life Expectancy Reduces Projected Lifetime Benefits for Lower Earners,” which focuses on how the fact that high earners live longer than low earners partially undoes Social Security’s progressivity. I’m going to say flat out that this claim is wrong and GAO should know it’s wrong. Upcoming event: April 6, The McCrery-Pomeroy SSDI Solutions Initiative Unveils Project's Recommendations. The Social Security Disability Insurance (SSDI) Solutions Recommendations Release Event will bring together experts, advocates, policymakers and interested stakeholders for an engaged dialogue about the findings of the Initiative and how SSDI and other programs can better serve those with disabilities, taxpayers and society as a whole. Please visit the SSDI Solutions Recommendations Release Event website for more information. On April 15, the Initiative on Business and Public Policy at Brookings will examine what role equity markets can play for individual retirement security, small business investment and whether they can help jumpstart American innovation culture by fostering the transition from startups to billion dollar companies. This event will be live webcast. Join the conversation on Twitter at #EquityMarkets. "The Extent and Nature of State and Local Government Pension Problems and a Solution"
Presentation: "How the Congressional Budget Office Uses Demographic Data"
The Congressional Budget Office posted a presentation from Julie Topoleski, Chief of the Long-Term Analysis Unit in CBO's Health, Retirement, and Long-Term Analysis Division, on how the CBO uses demographic data in its projections for Social Security, health care, immigration reform and other topics. You can read it online here or at the CBO's website.